Fantastic Beasts: The Crimes of Grindelwald is a 2018 fantasy film directed by David Yates and written by J. K. Rowling. A second Fantastic Beasts film was announced in October 2014, and in July 2016 Rowling confirmed she had completed the script. Depp was cast in November 2016, causing some controversy due to domestic violence allegations recently made against him, and Law signed on in April 2017. Principal photography on the film began at Warner Bros. Studios in Leavesden in July 2017. Filming also took place in England, including London, Switzerland, and Paris, and ended in December 2017. 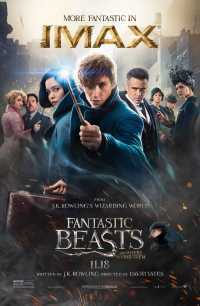 Fantastic Beasts: The Crimes of Grindelwald premiered in Paris on 8 November 2018 and was released worldwide on 16 November 2018, in Real D 3D, Dolby Cinema, IMAX and ScreenX.